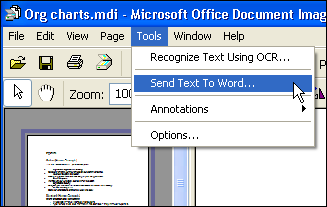 Microsoft Office Document Imaging performs text recognition using optical character recognition (OCR) and comes with Office 2003 and 2007. The quality of the text created by created by MODI depends in large part on the quality of the scanned document. If you have a poor quality image to work with, you may get poor results in your DOC file. In many cases it will help to get a better scanner (or purchase better OCR software), but it never hurts to try the tools you already have before spending additional money.